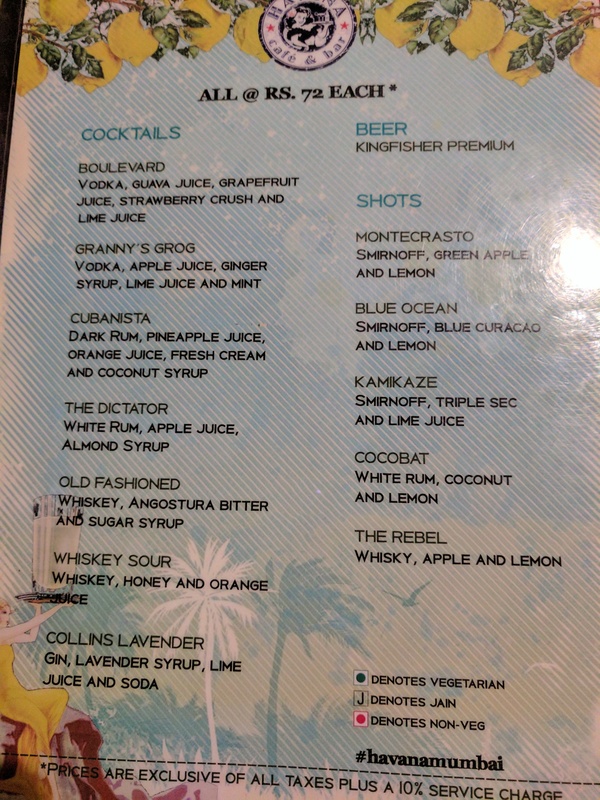 Did you know Polly Ester’s in now Havana Cafe n Bar? 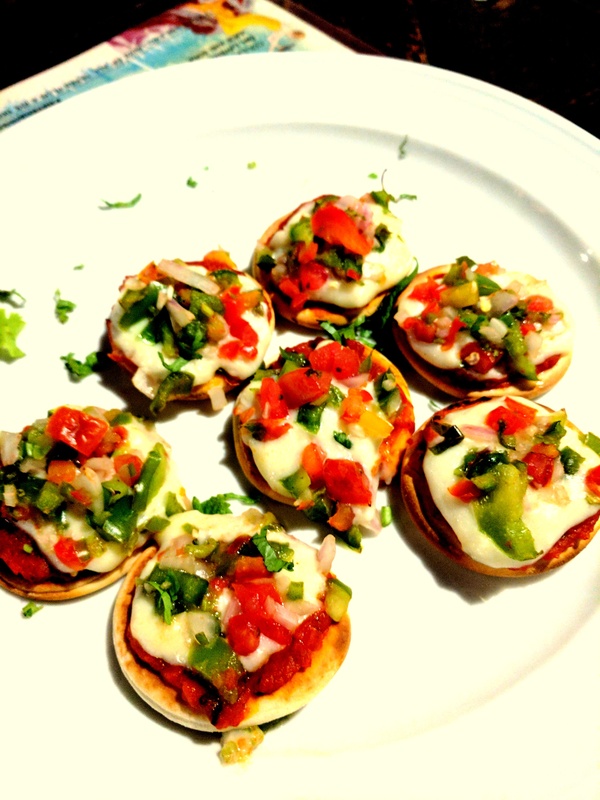 Did you know that Havana Cafe is now running a promotion from 6 p.m. to 8 p.m. everyday, wherein the Happy Hours menu has everything at Rs 72? (Mondays closed). 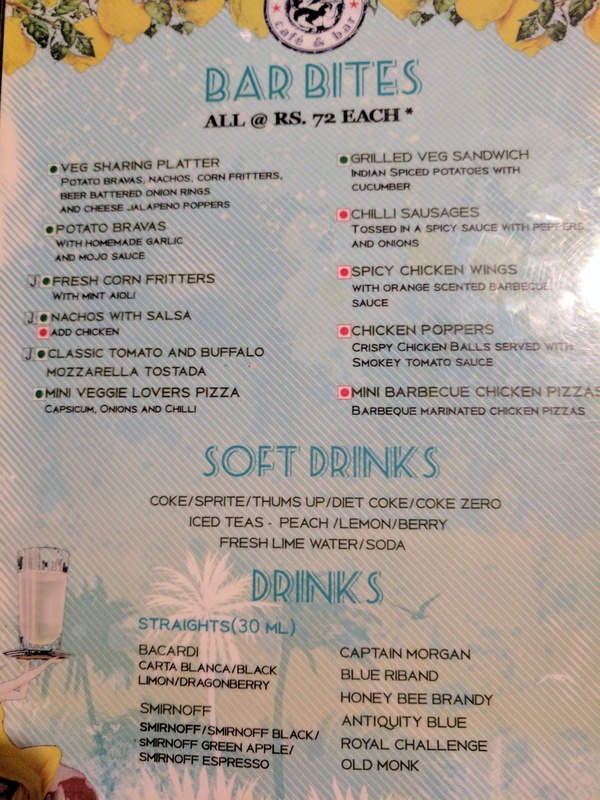 These are exclusive of taxes and service charge at 10%. I went there last week and had a great evening. It has a really good decor and seating is nicely arranged. Servers are prompted and very well-mannered. Service itself is prompt and efficient. 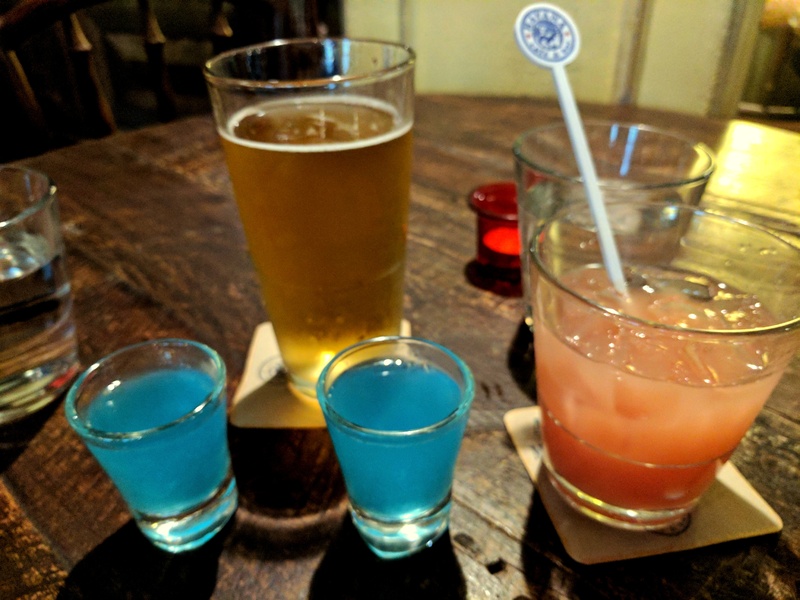 It was just the two of us, so we started with a shot each of the Blue Ocean. I followed it up with a Boulevard and my companion, with a beer. The shots were ok, so was the Boulevard. However, the Veg Sharing Platter was the highlight for me. 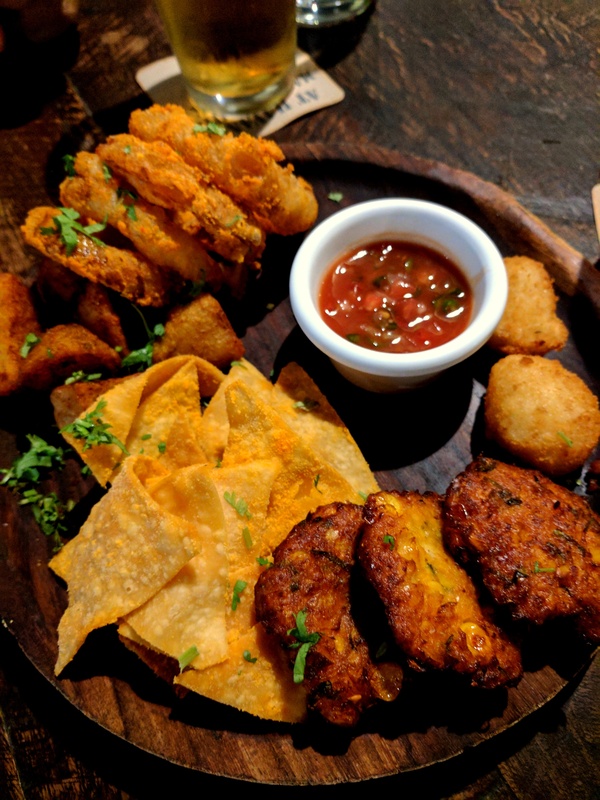 Its a well stacked up dish with small servings of potato wedges (called bravas), nachos, corn fritters, cheese jalapeno poppers and beer battered onion rings. The potato wedges were great, nachos average, decent corn fritters, yummy cheese jalapeno poppers and ditto for the onion rings. 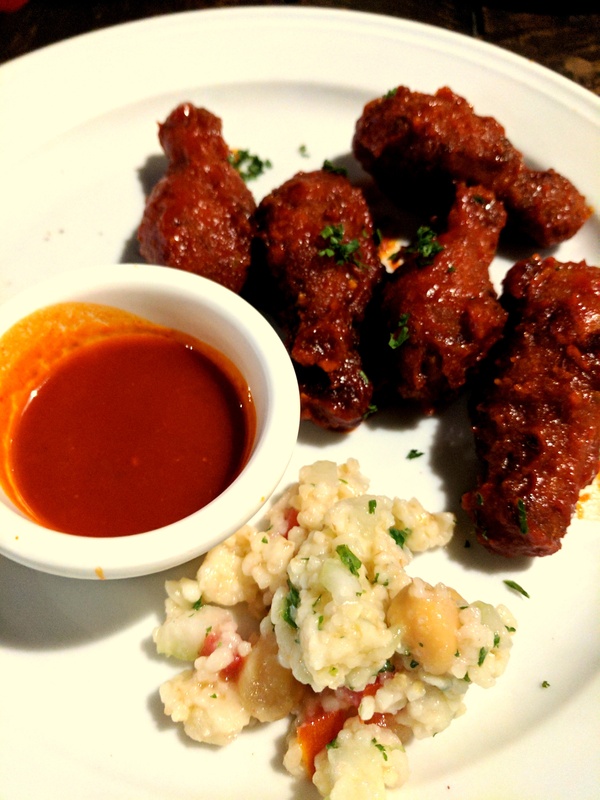 The salsa served with the nachos was strictly ok but I actually enjoyed having the nachos with the orange scented barbecue sauce from my companion’s plate – he ordered the Spicy Chicken Wings. Its a good place to sit back and enjoy great company with great music and decent food.